Sapphire glass with 9.1mm is scratch-resistant and antiseptic, never worn. Keep its optical art clear as a new. Super luminous’ amplification shows its hazy feeling in the small dial space. Unique visual movement likes to be out of a mirror. 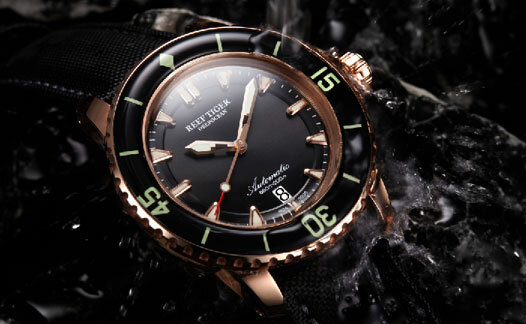 The Aurora Deep Ocean series dial designed by our designer shows seafloor like the black hole. Glimmer texture shading matches lighting effect perfectly. Between black and glimmer, showing black ocean give birth to limitless vitality. It is to perfectly match the name of Deep Ocean. The watch in diameter of 44.5mm is smooth and beautiful. Tooth crown, valuable case and dynamic curved lugs, close to the wrist, not only be comfortable but also reveal personality. The special texture of nylon combination with genuine leather band will make its texture become rich as time goes, increasing some restoring ancient ways colors for contemporary Deep Ocean watches. Italy imported calf combined with same color thread of hand sewing brings soft and ventilate wearing feeling. As is well known, movement is the heart of a watch. The stability of movement is directly related to the lifetime of a watch. 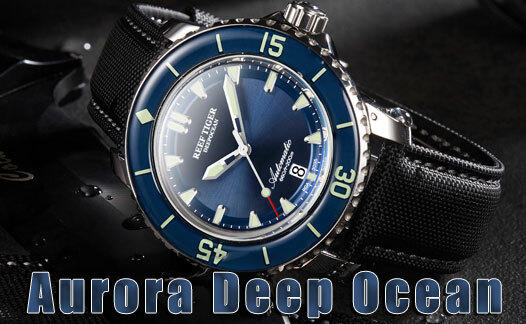 Reef Tiger creates excellent reef tiger 7901 automatic movement follow the watch factory. It has 24 jewels with 21600 swing frequency to make sure daily timekeeping error rate not more than 10 seconds. 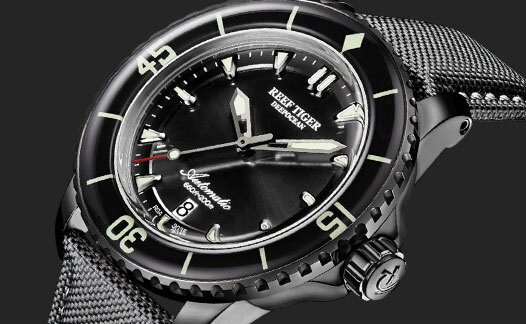 It is the core of Reef Tiger Swiss horological technology.